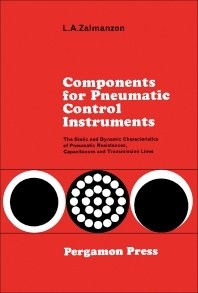 Components for Pneumatic Control Instruments: The Static and Dynamic Characteristics of Pneumatic Resistances, Capacitances and Transmission Lines provides a list of problems necessitating a detailed study of the characteristics of restrictions and chambers. This book discusses the problems that arise during the development, improvement, and use of pneumatic instruments. Organized into four chapters, this book begins with an overview of the theory and design of restrictions. This text then considers the main characteristics of restriction processes, giving the features of the restrictions used in different pneumatic control and regulating instruments. Other chapters deal with the static characteristics of pneumatic chambers with restrictions of various types. This book discusses as well problems of the dynamics of pneumatic chambers. The final chapter deals with the characteristics of log pneumatic lines and of systems with distribution parameters. This book is a valuable resource for aircraft engineers and readers who wish to understand the problems of the theory and design of elements of pneumatic control and regulating instruments.